Hi Karen, if you have a read of this topic: http://www.newzealandpottery.net/f58-how-to-upload-photos-into-topics it gives you instructions. If you are still having trouble, pop back in and I am sure someone will be able to give you further assistance. 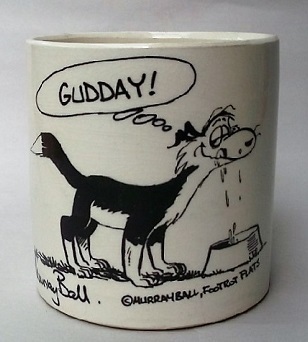 If you have any trouble regarding posting photos, you can email them to the site on newzealandpottery@gmail.com and I will post them for you. 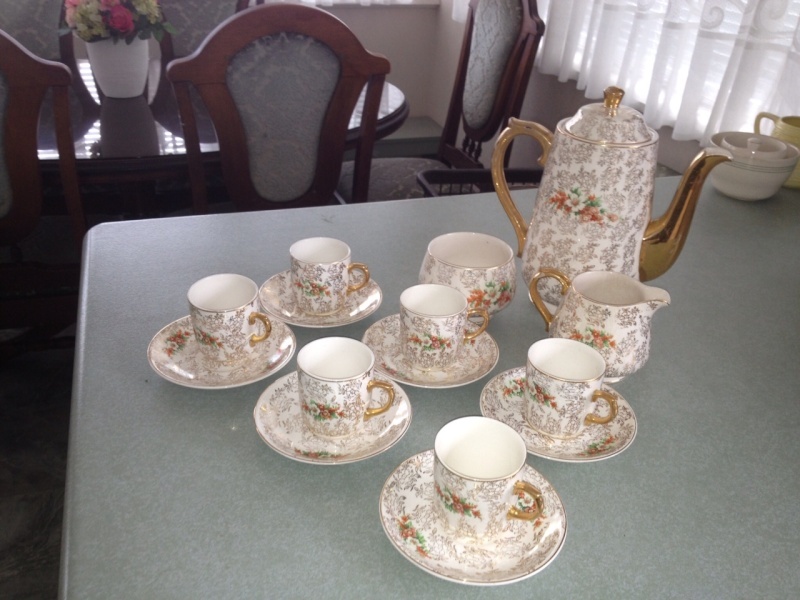 Can anyone tell me what tea set this is from Crown Lynn please? 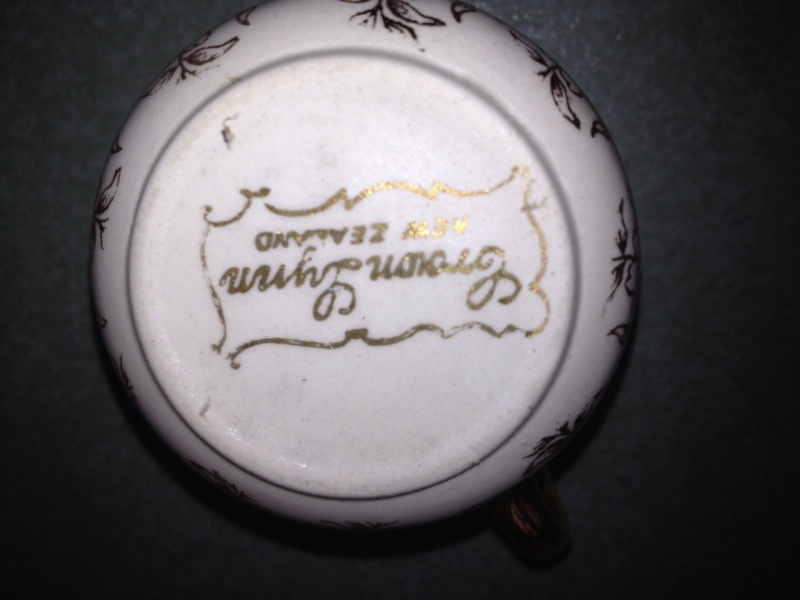 It is unmarked but my Mum used to work there and said she won it at one of the companies picnics. I also have another one of hers - do you know what this one is as well. I am selling these for her and also need an approx value if anyone can help too please. 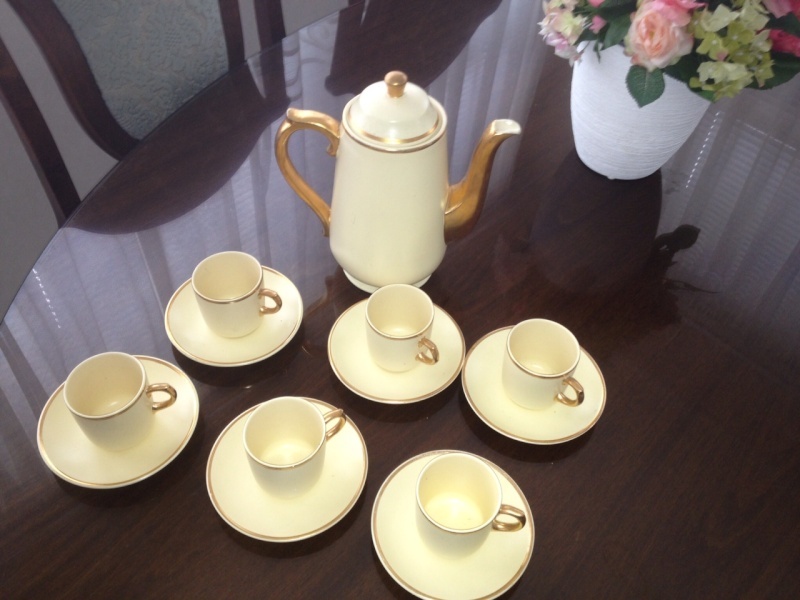 Great to see you have the photo posting under control,what gorgeous tea sets they are! I can't really help you with value, but I'm sure people will be along, if not tonight, then tomorrow, who can give you more of an idea. 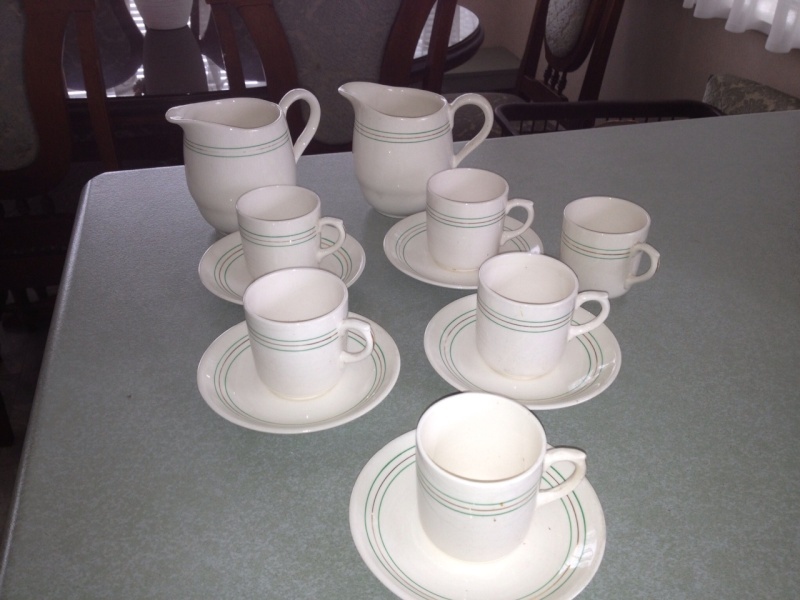 I can tell you that the green striped tea set was produced between 1948 and 1955, when that particular backstamp was in use. 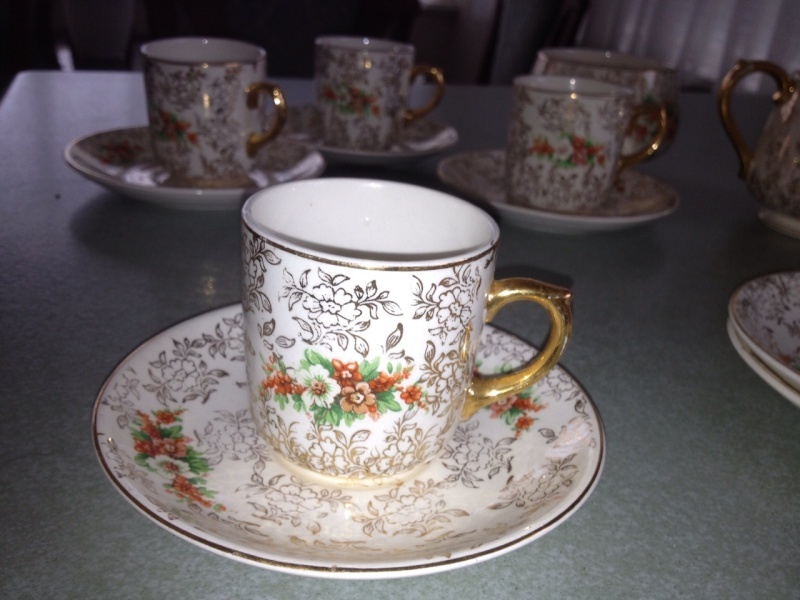 The floral one looks to be of the same era, is the cup shape the same for all three sets? The floral and green stripe look to be the same shape, but I can't quite tell with the cream/gold set. We don't have pattern names for any of those sets .... yet. I don't have any idea as to the value of them, but as they represent an early time frame in Crown Lynn's history, there should be some interest in them. I think they are just lovely! Is that a teapot just showing to the right in the second photo? I would love to see it properly if possible Karen. Thanks for your replies. I have another couple of photos. Yes Ev there is indeed a teapot. I will catch up with Mum on Wednesday night and get more details for you. On another note my Uncle was the Manager at Crown Lynn for many years as well - Fred Hoffmann. He ran the Titian factory didn't he, among other things? As the base shapes are all the same, this confirms the sugar bowl as a 776 really, because the coffee pot is a 777, the jug is a 775. 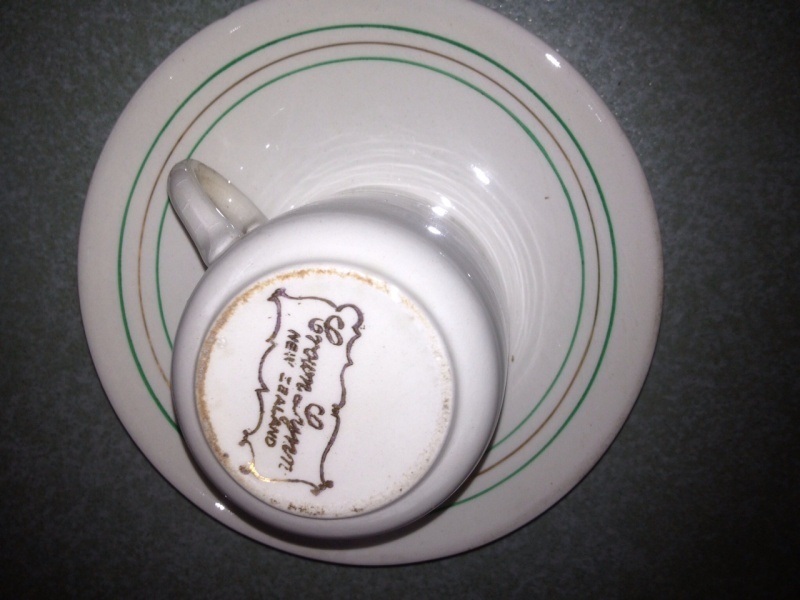 This must also mean that the little teeny coffee cups [demitasse] are shape 773 and the saucers 774!!! It makes sense to me !!! I feel confident enough to put the 773 and 774 into the gallery, when I locate them!